Black Ty Wraps 500 PC. 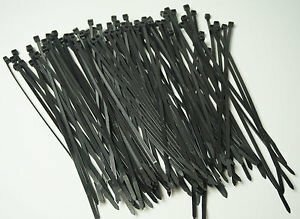 8" Long UV Cable Zip Ties 50 lbs Heavy Duty TYWRP Wire Tie. For use with cables, computers, heavy duty work holds to 50 lbs of brute force. UL listed and flammability v6.6Return Policy:- 14 days to return the item after received.- 25% restocking fee applies.- Buyer's pay the return shipping.Shipping Policy:- Shipping in 1 handling day.